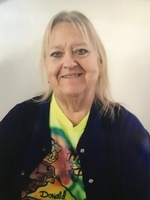 Rebecca Faye Hughes Deskins, age 71, of the Jessee's Mill Road section of Cleveland, Virginia, passed away Sunday (February 11, 2018) at Johnston Memorial Hospital in Abingdon, Virginia. Born July 14, 1946 in Honaker, Virginia, she was a daughter of James Warner and Mary Margaret Dye Hughes. A lifelong resident of the area, she was a graduate of Honaker High School and was a member of Lebanon Holiness Church. She enjoyed fishing, but most of all spending time with her family, especially her grandbabies. In addition to her parents, she was preceded in death by one son, Wilson Deskins, III, one brother, James Warner Hughes, II, one sister, Virginia Rich, and two nieces, Madge Keene and Nancy Rich. Survivors include three children, Joey Deskins and wife, Tammy of Lebanon, Wanda Gayle Shortt and fiancé, Daniel Alexander of Cleveland, and Angeline Ray and husband, Kenny; eleven grandchildren, Robbin, Faith, Megan, Morgan, Chloe, Brandi, Kandi, Keirra, Chyna, Sam and Donald; great-grandchildren, Colt, Adalyn, Ethan, Prissy and Charlie; special friends, David Short, Carrie Alexander, Deloris Jacobs and family, Beth Butcher and family; special nephew, Dave Keene and several nieces and nephews also survive. Funeral services will be conducted at 2 PM Wednesday in the Honaker Funeral Home Chapel with Rev. Stephen Musick and Rev. Greg Jacobs officiating. Interment will follow in the Hughes Cemetery in the John Sims Hill section of Finney, Virginia. In lieu of flowers, the family requests that memorial contributions be made in the form of donations to the Rebecca Deskins Memorial Fund c/o Honaker Funeral Home, P.O. Box 1620 Honaker, VA 24260. Pallbearers will be Joey Deskins, Kenny Ray, Sam Ray, Donald Keaton, Daniel Alexander, Rick Reynolds, Jay Howard and Anthony Ferguson. Honorary pallbearers will be Michael Carpenter, Dave Keene, David Shortt, Terry Queen, Ricky Mullins, Jeff Duty, Greg Jacobs, Jonathan Lester and Dave Hamric. The family will receive friends from 1PM-2 PM Wednesday. To send flowers to the family of Rebecca Faye Deskins, please visit our Heartfelt Sympathies Store.